Keep your inner fires burning. It's okay to let off steam. Sugarpill Eyeshadows in Lumi, Mochi, Hug Life, Hi-Viz, Supercharged, Asylum, Butter Cupcake, Love+, Subterranean, Soots and Stars, and Bulletproof. 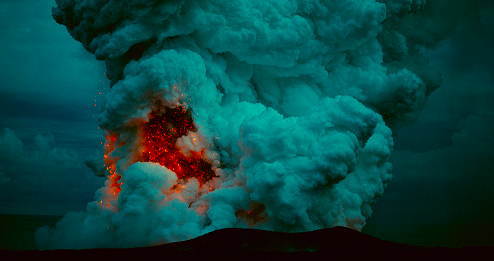 I created this look on a whim after I came across this gorgeous photograph on tumblr of a volcano. I don't know the original source, so if you do, please let me know so I can leave proper credit. Anyway, I hope you enjoy this makeup look and take care! Absolutely gorgeous! Great work Ronnie, love it! wow, sooo pretty! The colors are so vivid and I don't blame you at all for being inspired by this volcano picture! Thanks for the reminder to find inspiration in everything for makeup looks.